I am so excited spring is here! The only bad thing about spring is being allergic to grass. Every April and May, like so many others, I get the sinus headaches, itchy eyes, and runny nose. 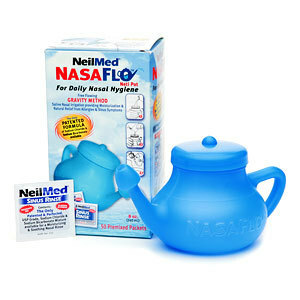 This year, however, I found a quick fix which has become my new allergy savior – the Neti Pot! It is a small tea-pot that you fill with water then put a small pack of saline which flushes out the nasal cavities of bacteria and all the nastiness up there. This week I started feeling the effects of my allergies on Monday and of course I had to fly out on Wednesday for work, so I immediately used the Neti Pot twice a day on Monday and Tuesday. By Wednesday, I was ready to fly! I’m not saying this replaces your regular doctor visit or allergy medication, but it is a nice alternative and organic!